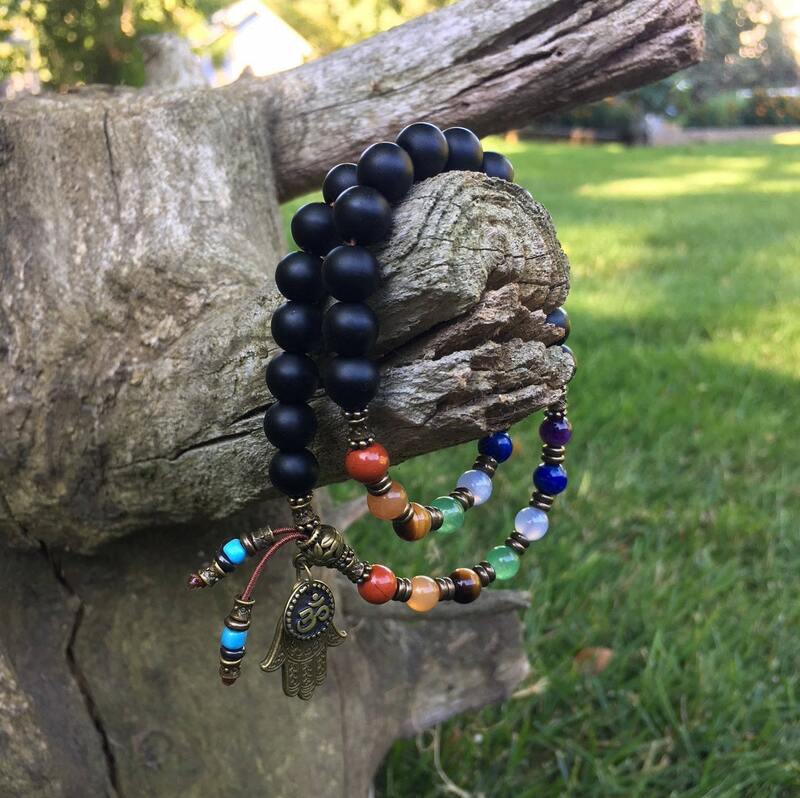 The Seven Chakra Hamsa Mala Bracelet features matte Black Onyx gemstones to ground and protect your energy, along with Red Jasper, Orange Adventurine, Golden Tigers Eye, Green Adventurine, Blue Lace Agate, Lapis Lazuli and Amethyst to balance all your chakras and keep you centered and focused. Black Onyx is an extremely protective gemstone. It prevents the draining of personal energy and absorbs and transforms negative energy. It encourages wise decision making, aligns the Self to a Higher Power, stimulates inner strength, physical strength, self discipline, self mastery, and intuition. 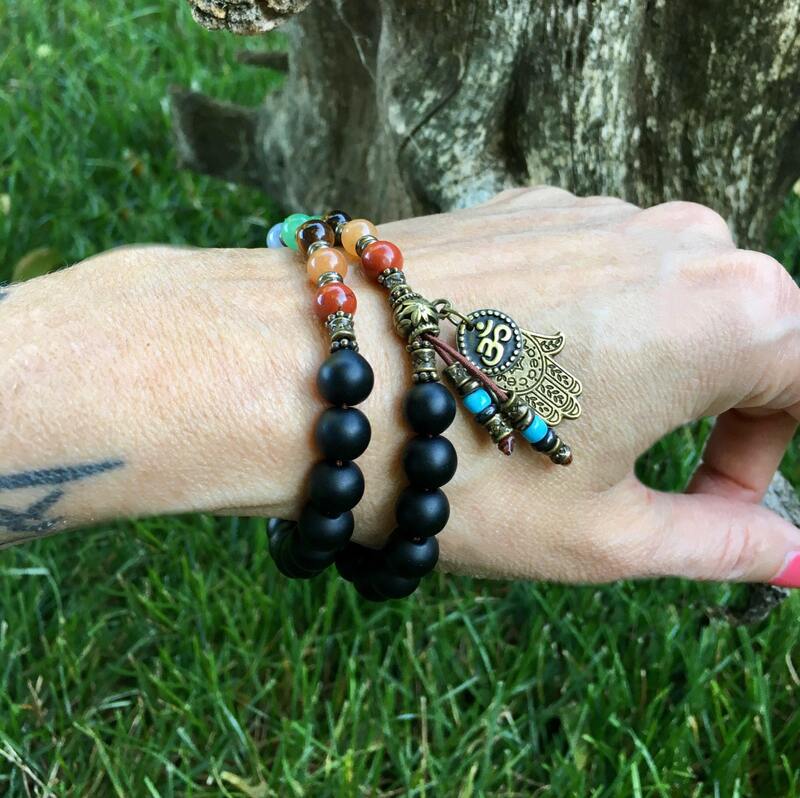 Wearing Black Onyx helps to boost confidence and relieve fears and worries. Muladhara (Root Chakra) - Red Jasper works with the root chakra to make you feel grounded and safe. It is gently stimulating and can aid in resolving difficult situations, often bringing new insights into view. Red Jasper can help neutralize radiation and other forms of environmental and electromagnetic pollution. It is an excellent 'worry bead' and can actually calm emotions and reduce stress when worn or held in the hands. It aids in dream recall and clears, stabilizes and protects the aura. Jasper in general is one of the oldest known semi-precious gemstones, mentioned in the Bible several times. Svadhisthana (Sacral Chakra) - Orange Adventurine crystals help to release fear, insecurity, depression and sexual blockages. They stimulate creativity, confidence, courage, happiness, humor and joy. Manipura (Solar Plexus) - Tigers eye promotes mental clarity, increases self understanding, brings issues into perspective and assists with problem-solving by un-clouding your emotions. It is widely associated with the solar plexus, known around the world as a confidence and self-esteem booster. Anahata (Heart Chakra) - Green Aventurine is known as the “Stone of Opportunity,” thought to be the luckiest of all crystals, especially in manifesting prosperity and wealth. Green Aventurine releases old patterns, habits and disappointments so new growth can take place. It brings optimism and a zest for life, allowing one to move forward with confidence and ease. 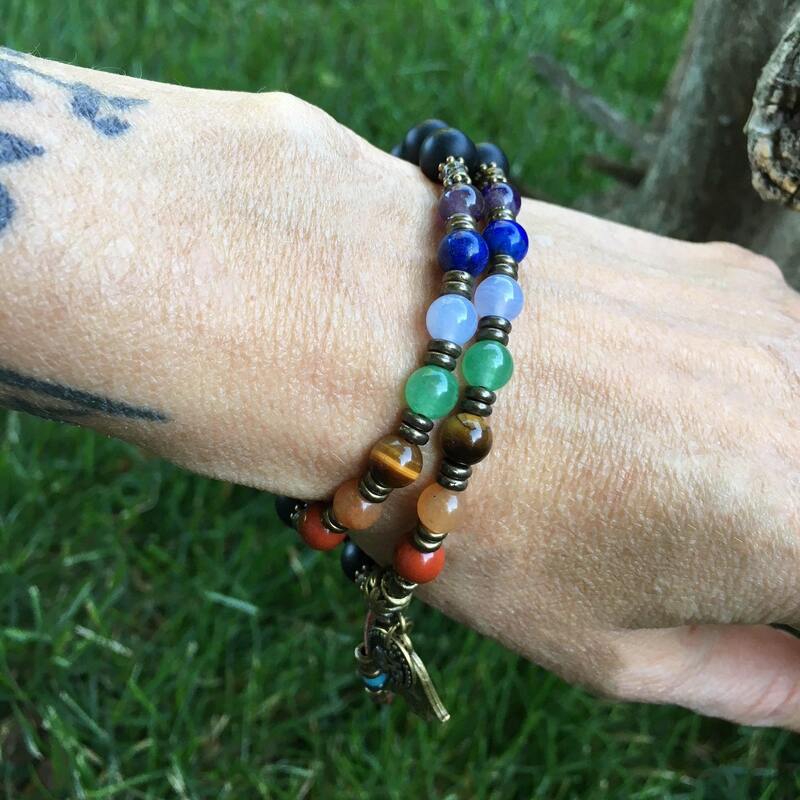 It enhances your creativity and motivation and helps you overcome life’s obstacles. It also helps with decision making and amplifies leadership qualities. Vishuddha (Throat Chakra) - Blue Lace Agate has a gentle, soothing elegance. Its graceful, circular design has a stimulating, positive effect on emotions and attitude. It is not a stone of protection, but rather of encouragement and support. Its circular flowing energy calms, uplifts and elevates. Blue Lace Agate assists those who fear sharing ideas in public or speaking their truth. It is a great gemstone for those who communicate for a living or anyone who must connect in a clear, intelligent manner. Blue Lace Agate also tranquilizes and relaxes the mind and calms stress. Ajna (Third Eye Chakra) - Lapis Lazuli is an ancient gemstone used by shaman and healers. Early civilizations valued Lapis Lazuli more than gold. These rich blue gems enhance communication and can bring truthfulness, openness, and mental clarity. They inspire you to say just the right thing, as if by magic. Lapis lazuli energy can quiet a busy or restless mind, lessen confusion and increase concentration. It also builds courage, confidence, and helps to overcome shyness. Sahaswara (Crown Chakra) - Amethyst comes from the Greek word, amethusos, meaning "not drunk". Our ancient ancestors wore Amethyst to prevent drunkenness, and to help bring calmness and clarity where is there is anxiety and confusion. Amethyst enhances spiritual awakening and spiritual growth. These gems enhance focus, increase intuition, stimulate psychic abilities, and build a protective shield around your physical body and energy field. Amethyst strengthens resolve and is widely known as a fiercely protective stone. The symbol Hamsa, also known as the Hand of God, is an ancient symbol of protection, bringing happiness, luck, health, peace and prosperity.